We arrived a few minutes early for our staff meeting at Maine's new senator Angus King's office in Augusta, the state capital. The federal building has a metal detector and about seven middle aged guards at the door, and it took us considerably longer than we had planned to pass through security. My friend Abby Shahn had to remove her belt, shoes, and get wanded by a metal detector. I had to drink the water from my water bottle in front of the one female guard, to prove that it was actually water. No, she was not kidding. Marge Kilkelly -- who was a Democratic legislator in Maine before becoming senior policy advisor to Angus -- was in state for the congressional recess week, and she said it took her a really long time to get through security, too. Apparently the guards at the federal building have been told to give the order that no one is supposed to photograph "a guard doing his (sic) work." An aggressive older man ordered me to erase the photo I took of Abby getting wanded, and I did it because 1) I wanted to get to my appointment and 2) apparently the guards did not realize that when someone holds a pink rectangle up in the air, she is also taking a picture. So we still got the clandestine photos above. We did our meeting, which we had requested soon after Angus got elected in November, by presenting a lot of information we thought might lead Angus to conclude that riding the "stop war spending, it's bankrupting the Treasury" platform might be a path to public acclaim. Some info was to show that the will of the people of Maine is overwhelmingly in favor of low spending on "defense"( Penny Poll article from the Kennebec Journal). National Priorities project trade offs and charts showed that the federal government is seriously out of whack, currently spending 57% of the discretionary budget on military. We also left behind a case study of Bring Our War $$ Home campaign as a coalition effort in Maine and in many other parts of the U.S. and articles about the U.S. Conference of Mayors resolution pleading with the federal government to spend less on wars, and more investing in the cities where people live. We had printed a copy of the Pollin & Pelletier report "The U.S. Employment Effects of Military and Domestic Spending," which refutes the claim that military spending is a good jobs program. I consider this the clincher because it refutes the b.s. that is always trotted out when there are threatened cuts to the Pentagon budget: But we will lose jobs locally if this funding is cut! Read the report to find out why investment in several other ways produces far more jobs -- more than twice as many, in some cases. It fell to Codepink associate Pat Taub to get down to business on drones. Since Angus had made a splash in the news asking a few pointed questions about drones of John Brennan, nominee for CIA director. He had also suggested a special court to review the extrajudicial assassination plans, but only those targeting Americans, so Pat had brought Desmond Tutu's op-ed calling for a respect for all the humans on the planet. 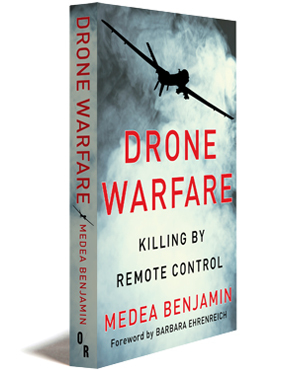 She had much documentation of the effects of drone strikes, including photographs, and a copy of Medea Benjamin's book Drone Warfare, which is well-researched and current. Buy one for your senator. We also shared a copy of NYU/Stanford law school report "Living Under Drones" a most substantial refutation of the claim that drones are in Angus' words a "humane" weapon as currently used by the U.S.
Abby, going as usual to the heart of the matter, wanted to ask: How can the people's voices can be heard in government? She observed that this has consistently failed to happen. She has a long memory so she started back at Vietnam naming all the wars people haven't wanted that the U.S. has waged anyway. (A large campaign contribution would no doubt amplify the people's voices just like it does for corporations.) I wondered aloud who Angus would be representing in Congress: the people of Maine, or General Dynamics? Then we all talked about energy policy and we found out that because Maine is so dependent on heating oil, Angus favors natural gas as a "transitional fuel" and that he favors FRACKING!!!!! Objections to the folly of polluting ground water were waved away by Marge with the mantra "transitional fuel." We pointed out that we had been in "transition" since Jimmy Carter wore that cardigan and turned down the thermostat in the White House, which was so long ago it was the first presidential election where I was old enough to vote. Also that there is vast hydropower leaving the state on long distance lines, leaking energy as it goes, for the profit of wealthy people, while the Mainers whose rivers were dammed to make the electricity do not benefit from it. Also that many of us heat with renewables, use solar energy, and want to see sustainable sources like tidal and geothermal and wind explored. In the absence of meaningful congressional oversight of the executive branch waging wars both overt and covert, it is hard to justify teaching kids about checks and balances as if they actually existed. I probably shouldn't have said that because it's one more black mark in my file. I know many will think we were fools to waste our time and probably get iris scanned and who knows what else to meet with a representative of a broken government that no longer represents the people. We are all grandmothers and idealistic and we did once believe in the democracy we supposedly lived in. We're worried about the future for our grandchildren, like pretty much everybody is nowadays. So we visit our senators. But since money equals political speech, and we don't leave behind a big fat check, it mostly amounts to going through the motions. We do it because you still can. That is, if you can get past Homeland Security. 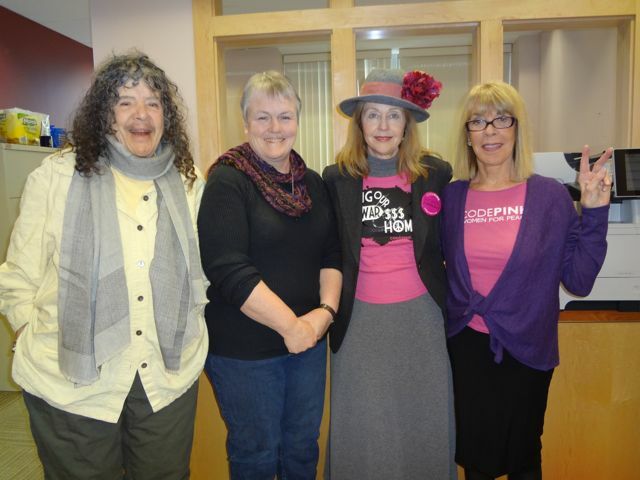 Codepink associates with Angus King's senior policy advisor Marge Kilkelly in Augusta today.